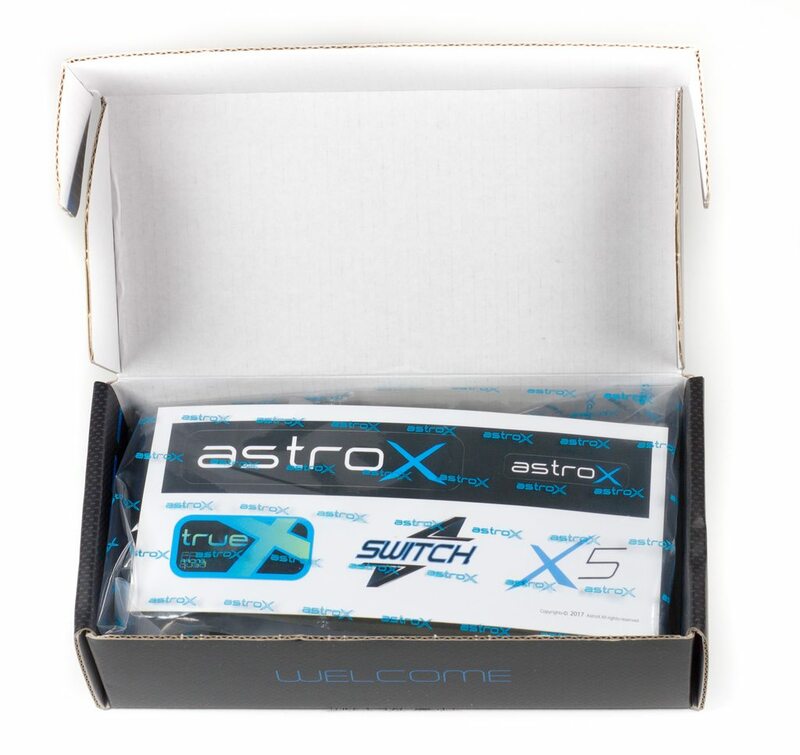 AstroX have finally been getting the recognition they deserve recently, so if you've been keeping up with quad frames at all you'll have likely already seen or even built your own Switch by now! The review is a little delayed as I wanted to get some awesome footage up, but I had issue after issue with some of the hardware I was running, so I've decided to delay it no more and just get on with the build log - minus any footage I would have used! 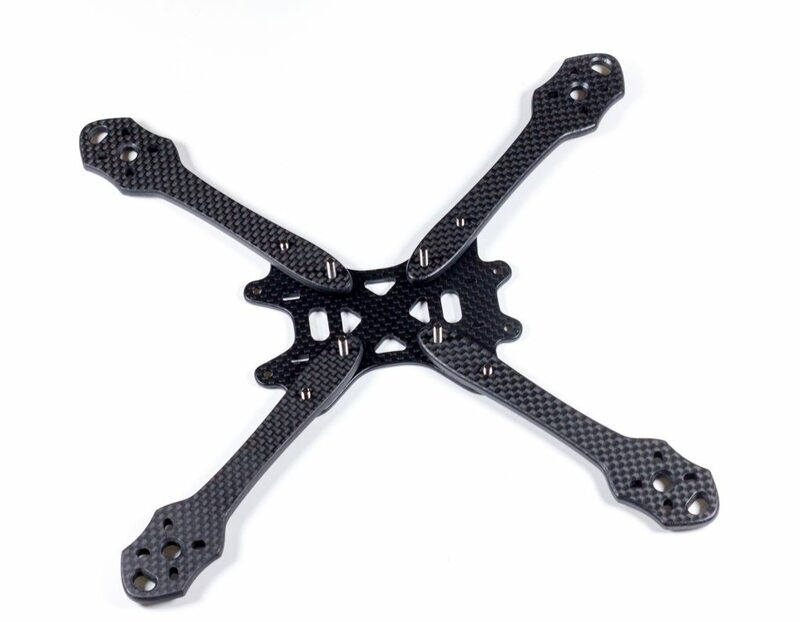 So, to prefix the post as I said above - AstroX are taking the frame market by storm with frame after frame coming out that offers unique design principles, as well as being by far the best quality carbon and best looking carbon by far of any manufacturer thus far. Their rounded silky-finish arms are signature to the AstroX brand now, and more modernly featuring flush screws by using counter-sinking. 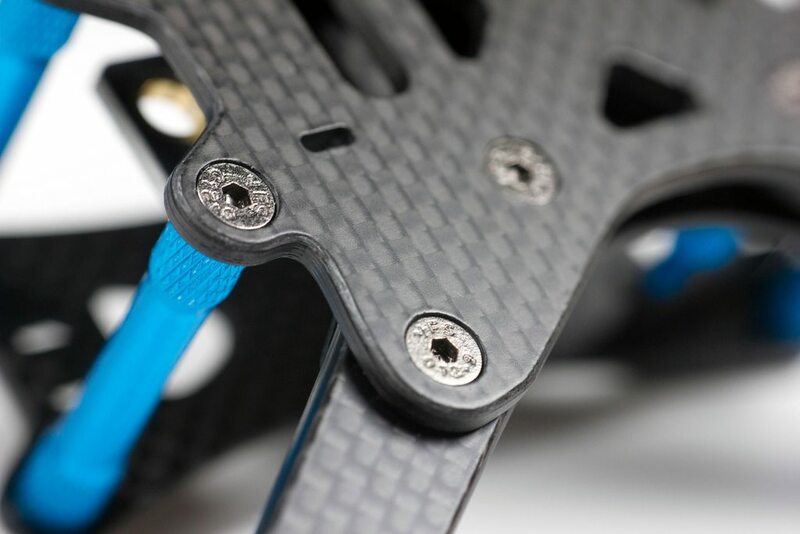 They were also one of the first frames to use the the insert nuts that sit inside the carbon. The Switch series moves the AstroX lineup of frames one step further, learning on each iteration of frames and catering to an ever changing market and their needs. Without further ado lets go over the un-boxing of the frame, and see what we're up against. 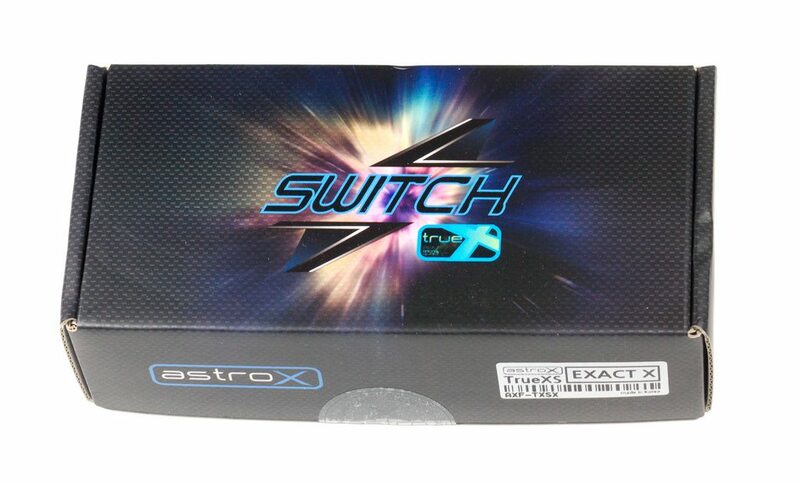 Here we have awesome packaging that AstroX are also known for, it has to be said most frames do not spend much on packaging but AstroX do go the extra mile here. Inside, everything is packaged into a single shrink-wrapped and branded bag, to keep everything from moving around. With everything out of the packaging we can see there's a ton of parts here, as well as many extras depending on how you want to build the frame. 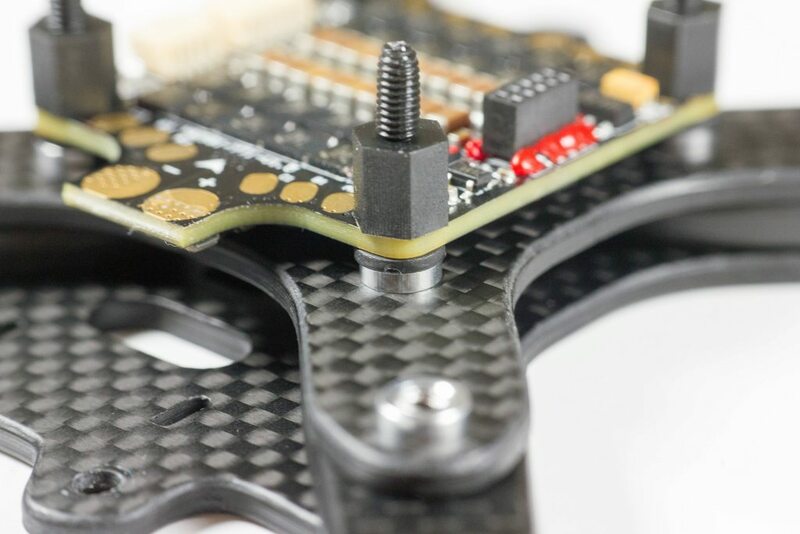 The best touch I find here is that there is rubberized pads for virtually every plate you would expect to be able to mount a lipo, meaning you can top or bottom mount without any risking of your lipo ejecting. And of course they are all CNC'd perfectly to the shape of the frame. 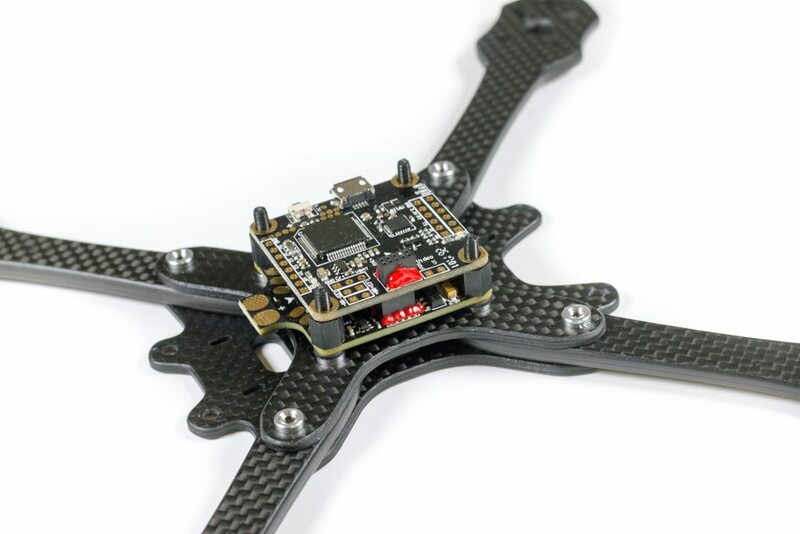 Included as well we can see there's a PDB supplied with 2 capacitors to reduce noise from the ESC's, for those with a keen eye you'll recognize the design similar being to Matek - this is because it is made by them - a great addition to the frame and Matek PDB's have always been good quality. 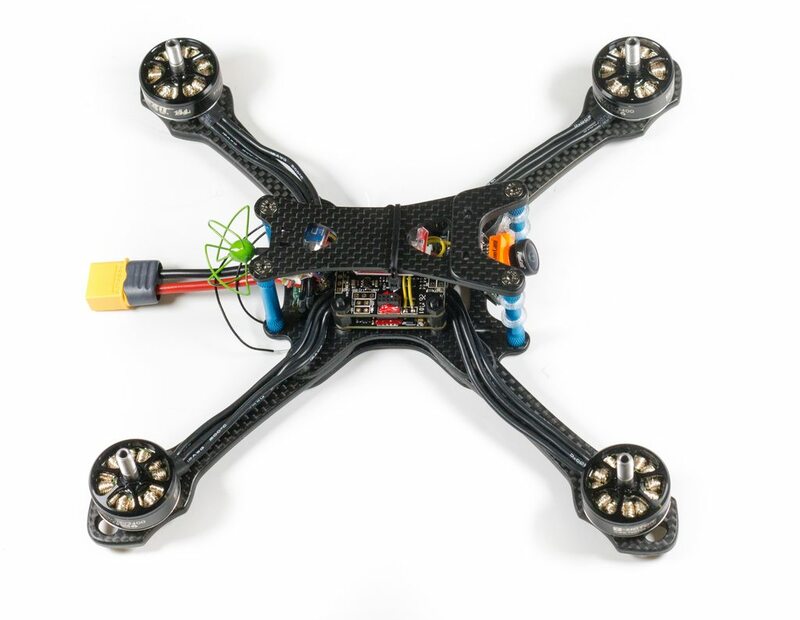 So let's get on with the build log, first up we'll be building the frame up without components to get that all-important total frameweight as well as demonstrating how it all goes together. First up we need to insert the counter-sunk screws into the bottom plate, making sure to use the correct ones - the longer ones go in the inner holes, with the shorter ones being for the outside of the bottom plate. Once that is done we can slide the arms over ready to mount the top plate with the insert nuts. 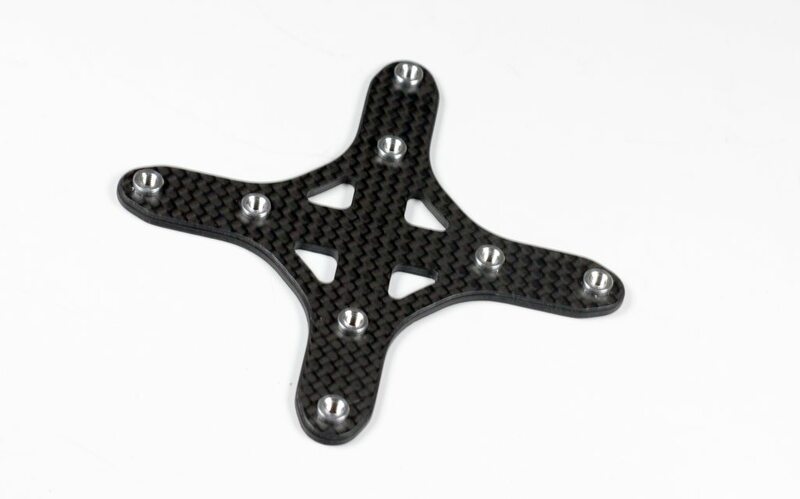 To install the insert nuts a spare screw and washer are supplied to pull the insert into the carbon without risking stripping your normal screws or stressing parts that shouldn't be. To do this, seat the insert nut on one side, and gently screw in the screw until it is finger tight, ensure that the insert is seated as centrally as possible, and use a screwdriver to tighten up the screw until there is no gap. You do not need to excessively screw this, just enough that the washer is seated firmly between the carbon and screw with no gaps. The washer is use so that it distributes forces over the whole washer and not just the small bit of carbon that sits in line with the screw head. Once you've done one corner, apply the same method to the other 7 holes. Once you've done them all you'll end up with something like this. There's no correct side to the plate, so just ensure the nuts are all on the same side at least. With that all done you can now insert the top plate onto the arms. 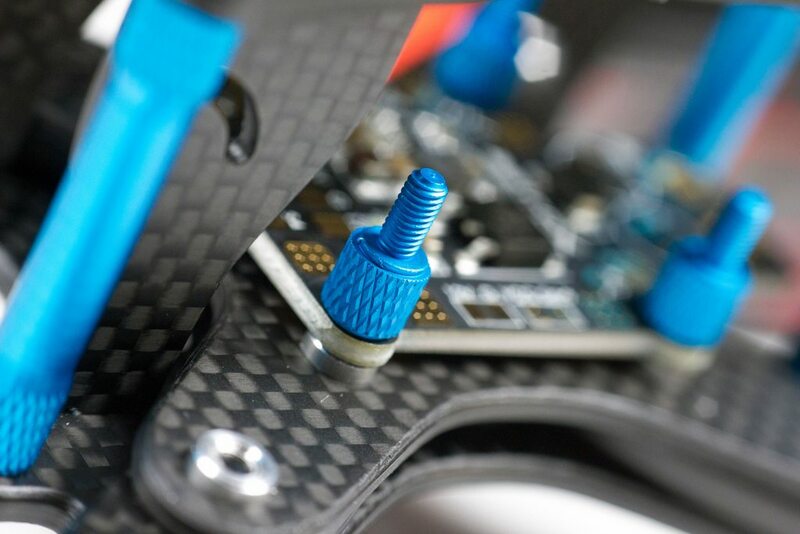 You'll probably have to back off all of the screws apart from the first one so they sit flush with the carbon so that you can tighten up the first one. I'd recommend loosely screwing all of them in, and then tighten them once you have confirmed they all sit correctly and there's no obvious issues. Once that is done you can use some of the smaller counter-sunk screws to attach the standoffs to the lower section of the frame. Next up you can do the same with the top plate. You'll notice the holes in the front of the AstroX frame are not countersunk - this is because there is an additional reinforcement plate that helps to protect the camera and frame from full frontal impacts. You can choose to either use this with the counter-sunk screws, or alternatively you can take some of the spare normal headed screws and go without the plate. 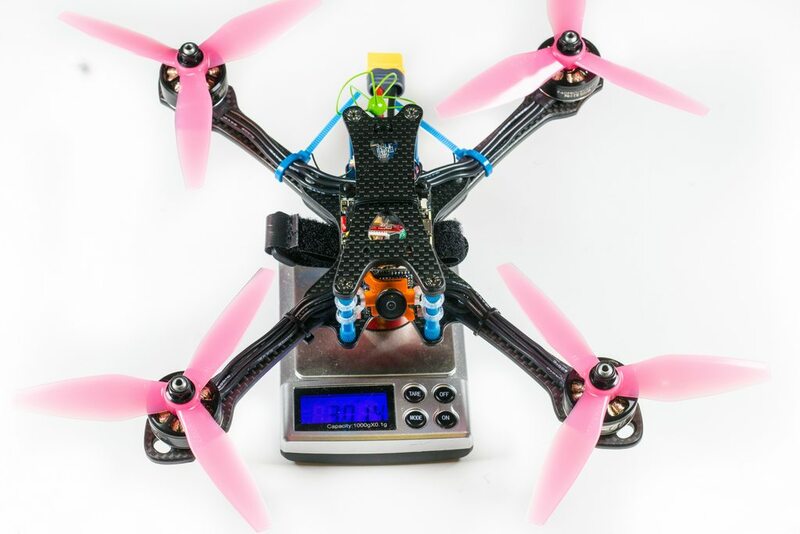 With the whole frame put together you should be weighing in around the 91g mark, here we have it as 91.7 grams. 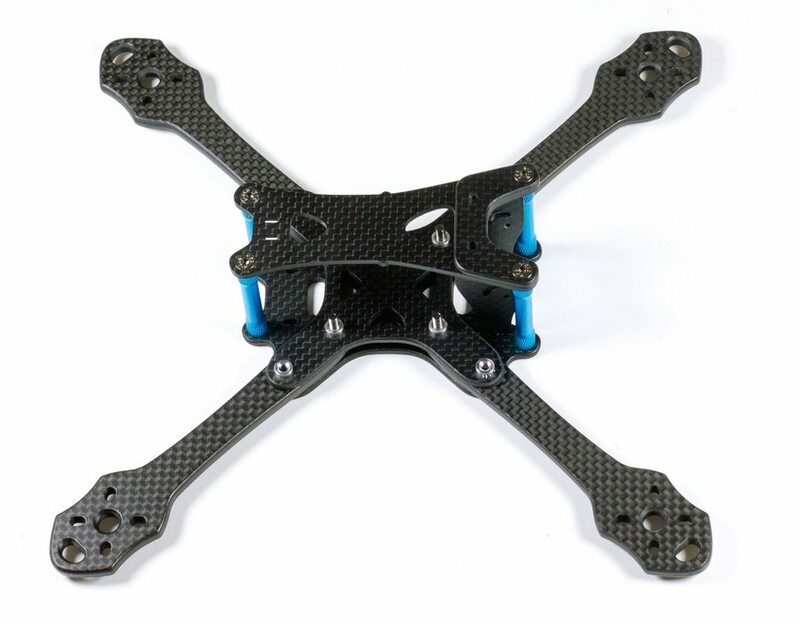 This will be fractionally lighter because I will not be using the camera plates, I intend to run with a Runcam Micro Swift as opposed to the Mini Swift to save a bit more weight. I've also not weighed it with the PDB because many are going towards the 4-in-1 ESC route (as I will be), so it gives a true figure before adding any components at all. I have to give a big shoutout to Dunkan Bossion and HobbyWing combined as they kindly sent out the HobbyWing gear for review. There has been absolutely nothing but good reviews about their gear and I'm proud to be able to use it as part of the review, and it will also feature in reviews in the future! For those who do not know Dunkan is one of the other 3 European pilots (including myself) to make it on to the Drone Racing League this year, and he ended up finishing in 4th place overall! Here's a quick snap of everything we have, it is set to be a fantastic build! Next up is the motors, these are a brand new set of F40's as I tend to cut the motor wires pretty short to allow for arm esc's, but of course with a 4-in-1 ESC we need those wires as long as possible! 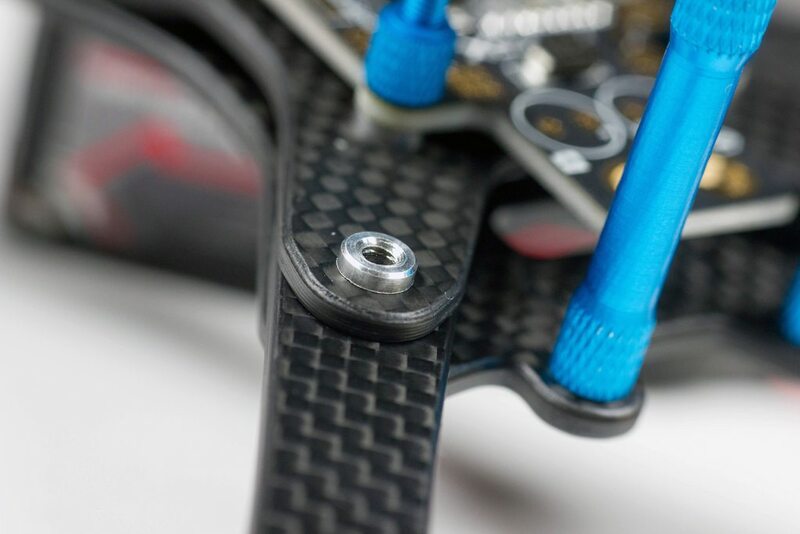 The HobbyWing FC & ESC combo comes with a set of standoffs that perfectly fit the boards stack together. 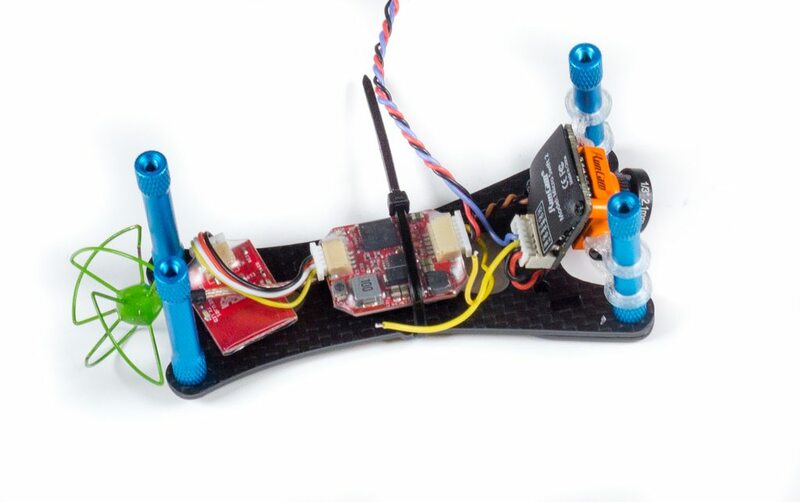 If you notice by the red epoxy there's a connector - the flight controller has a set of pins which install onto this, giving you full connectivity to the esc's as well as power to the flight controller. Here we have the flight controller seat on the frame, with the connector sat in as we'd expect. 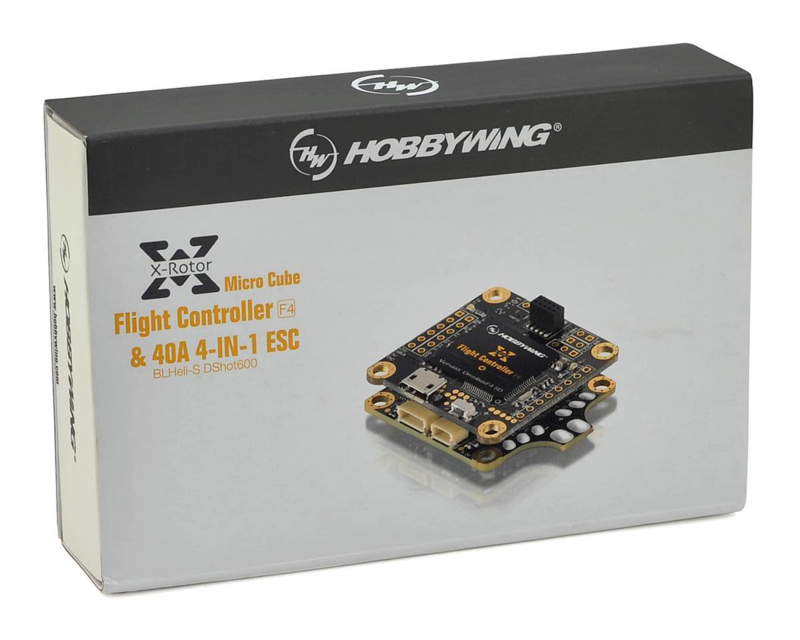 You'll also notice there's a connector on top - I'm not sure what this can be used for as of yet, but I expect HobbyWing or other companies will be coming out with other gear that can be installed on top - perhaps OSD's or a video transmitter?! 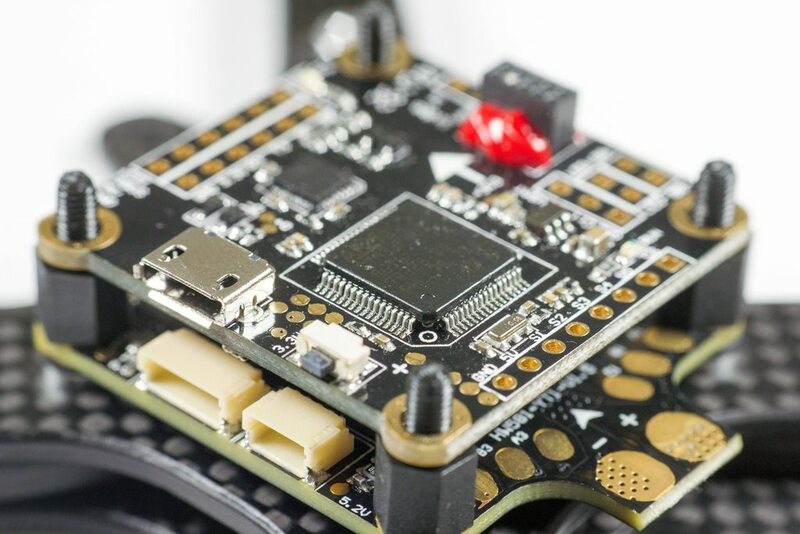 Here's a closeup of the FC - we've got an easy to access boot button, and as you can see there's no limit to the connectivity here on both the ESC and FC, allowing either of them to be used with other hardware if you so wish to do so. I've soldered up the motor wires and added in the XM+ using some pin headers - this makes for a super neat build that sits perfectly over the gyro without touching it, reducing any possible vibrations that would usually be transferred across. Next up we have the power wires and associated XT60. You'll also notice here I've added a capacitor to help try and reduce any noise we may have on the system. 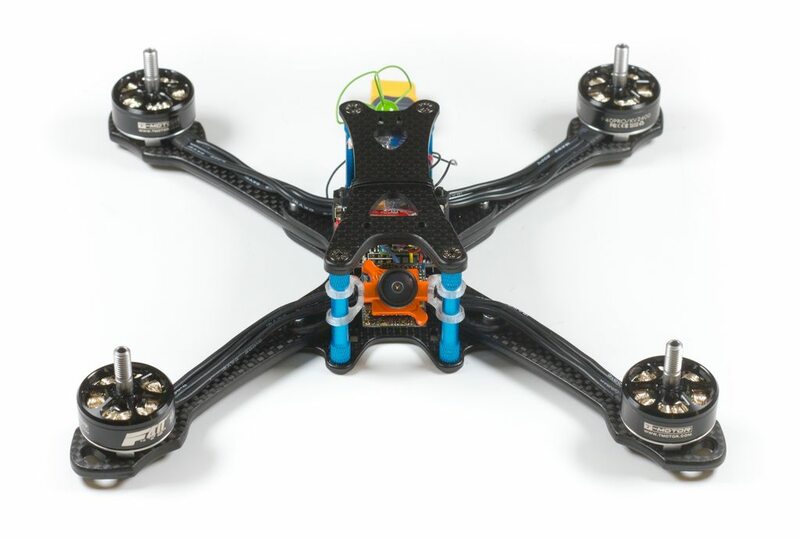 Up next we can focus on the FPV gear and top plate. You'll see we essentially have everything installed here very neatly - and it all makes for a very light setup using the uFL circular polarized antenna. 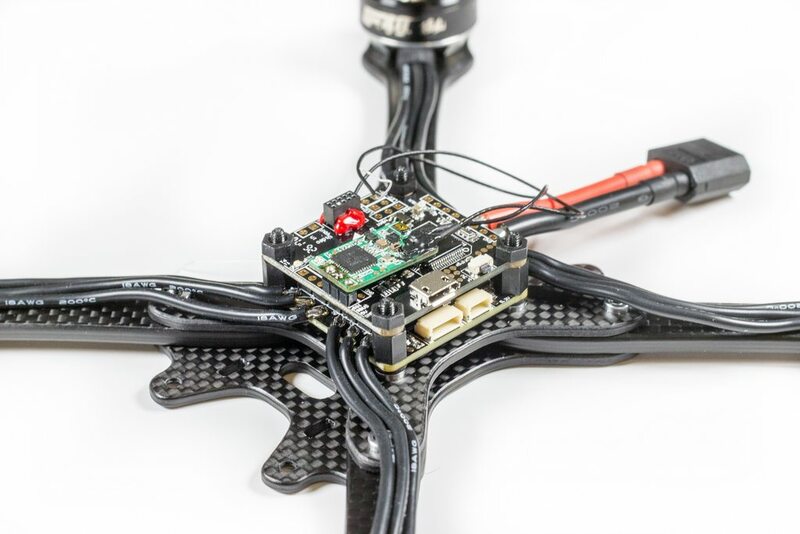 I've 3d printed the Swift 2 mounts which are available on Thingiverse here, and are actually Hyperlite Floss mounts, but they work with pretty much any frame that has standoffs. 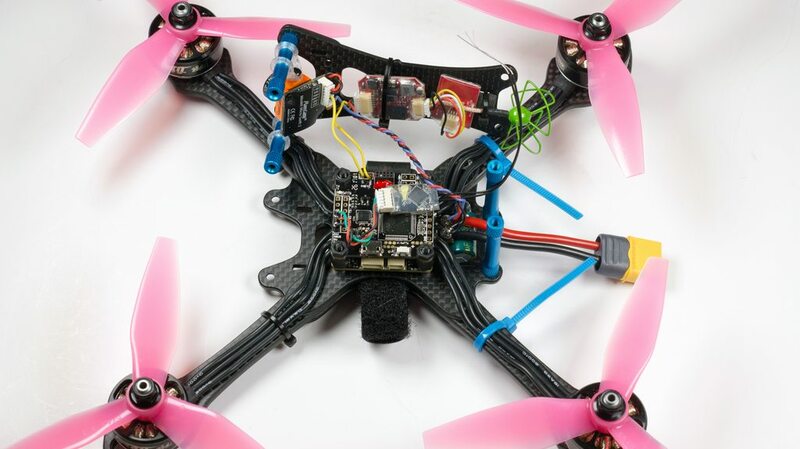 For people with a keen eye you'll notice that the 2 video wires (yellow), are currently not connected to each other - that's because the FC has an OSD built into it so we'll be making full use of that to get the most out of the FC/ESC stack! Here you can see we've soldered up the power wires for the video transmitter, as well as attaching the video wires to the FC to get the OSD. All we need to do now is add on the screws for the bottom sides of the standoffs and the frame is complete! 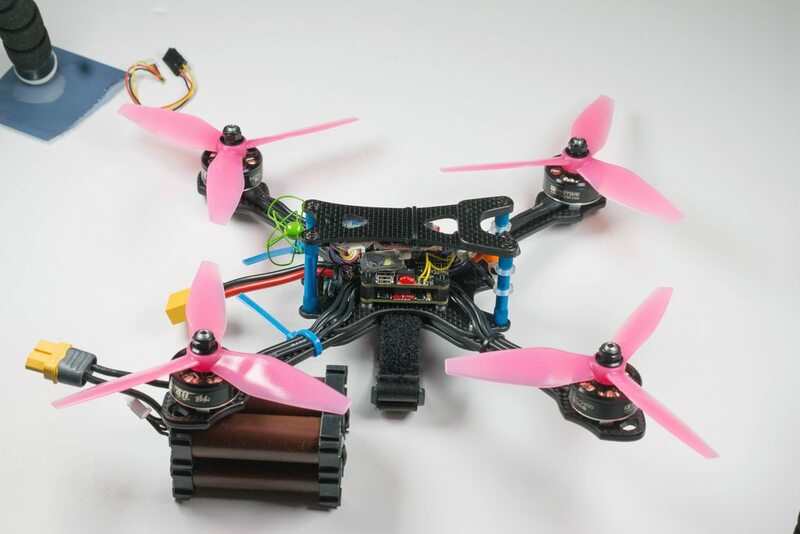 What an easy build with essentially a connector-less ESC/FC stack, and very few wires are also on the Video side of things. 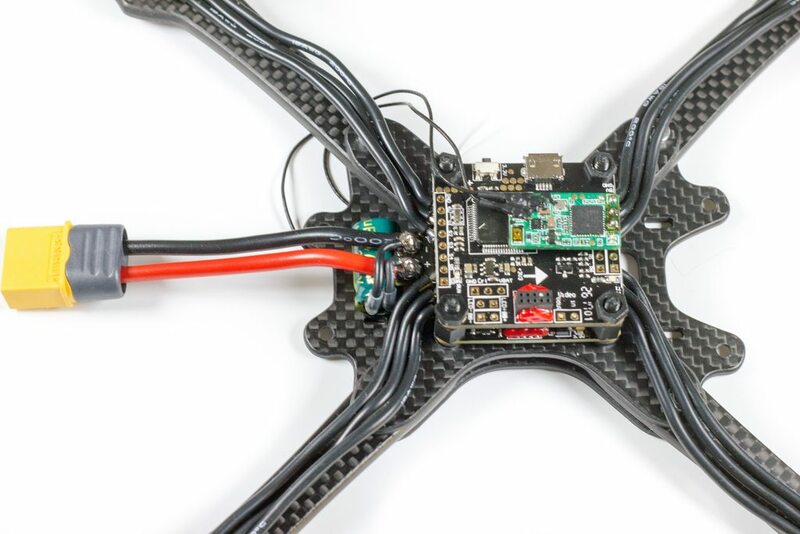 From the side we can see just how little the antenna is exposed during crashing - this should be ideal for racing with basically no damage ever happening to the antenna, but still being far enough out of the frame to get good video signal. 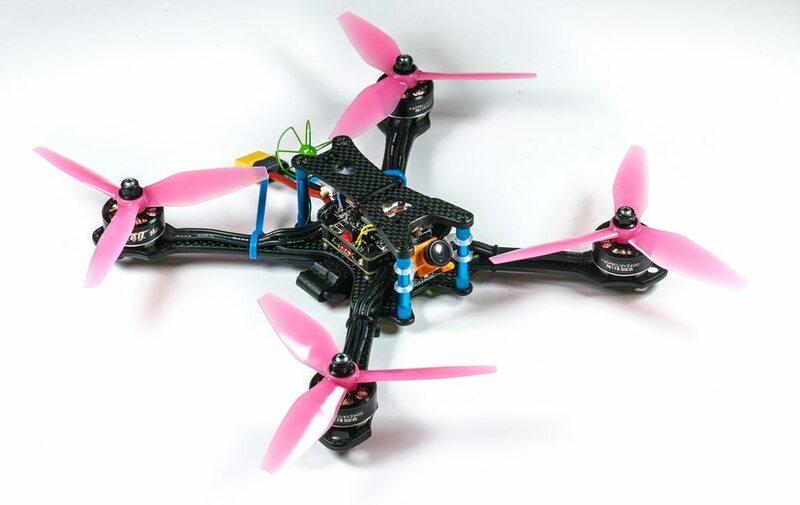 We've added in some HQProp 5x4.5x3 V3 propellers (my current favourite for this motor), and it compliments the blue scheme perfectly. And they're multiplying!! 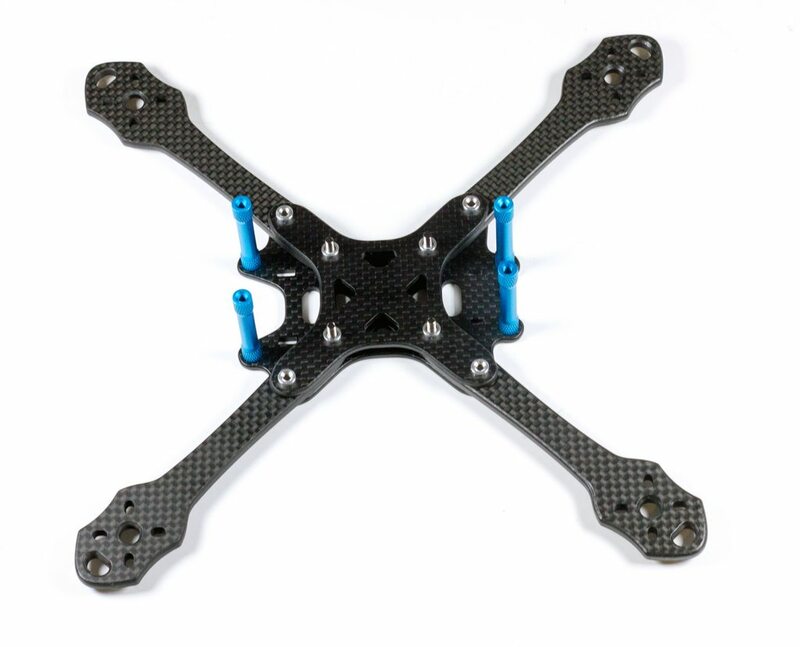 So I've also got a Switch StretchX frame that Boohwan was kind enough to send, so I'll be trying stretch frames again to see if I can get my head around it for UK style tracks. I've always been put off by them from previously flying experiences, but I can see how some of the benefits are valid so I've built another up again to really try and get to grips with it. 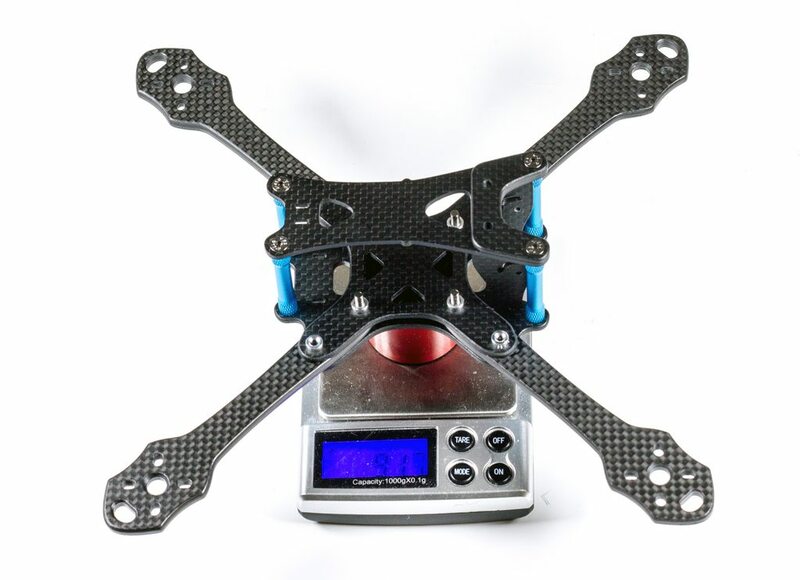 Weighing in at 301.4 grams we've got a great build that I think is an ideal weight. 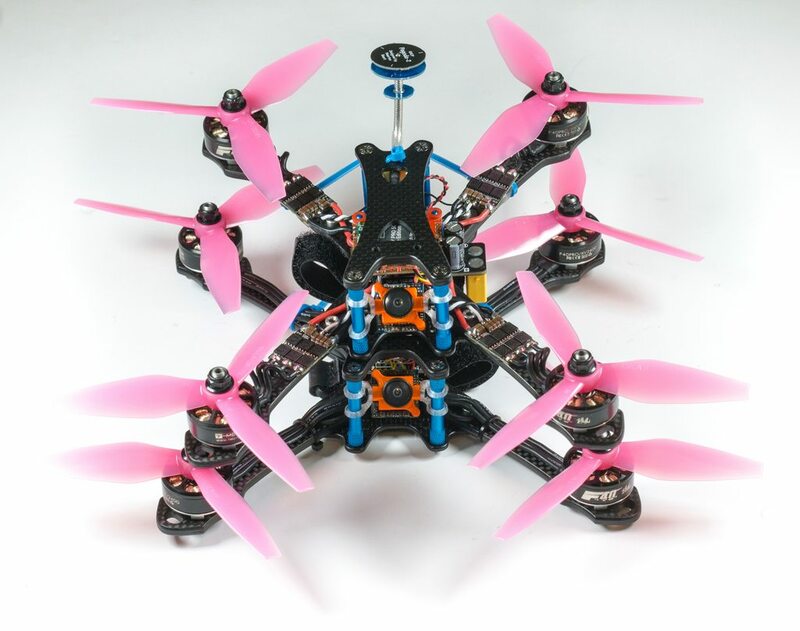 I've always aimed for 300g personally when building quads, so to be pretty much smack bang on with a fantastic set of powerhouse components I'd say this is a great win. The flush screws look so good here! Knurled custom blue FC standoffs look great here matching with the outer blue standoffs. Countersunk nuts leave a clean and tiny look and feel to the build, as well as reducing any requirement to get a screwdriver in there if you have to replace an arm. 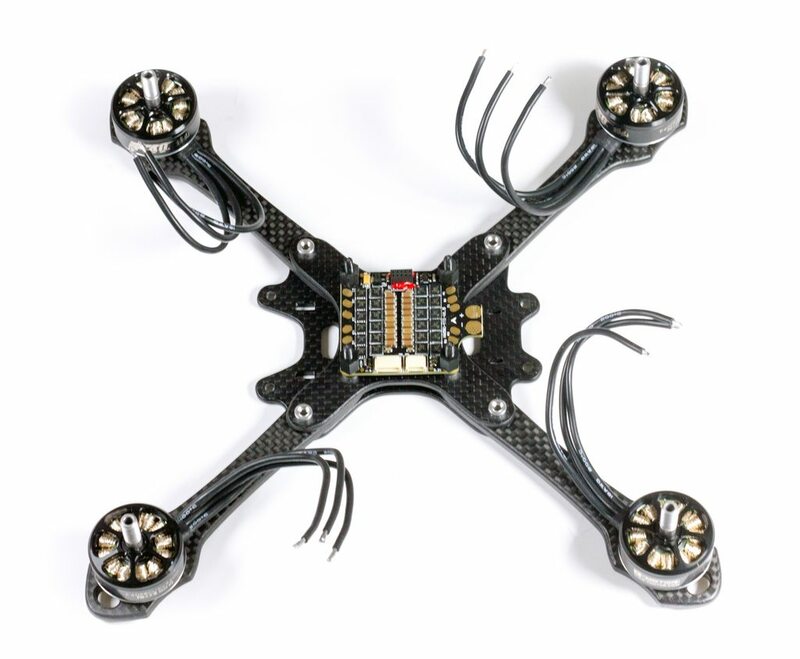 This is ideally if you are running a 4-in-1 esc because you'll have wires in the way for sure. 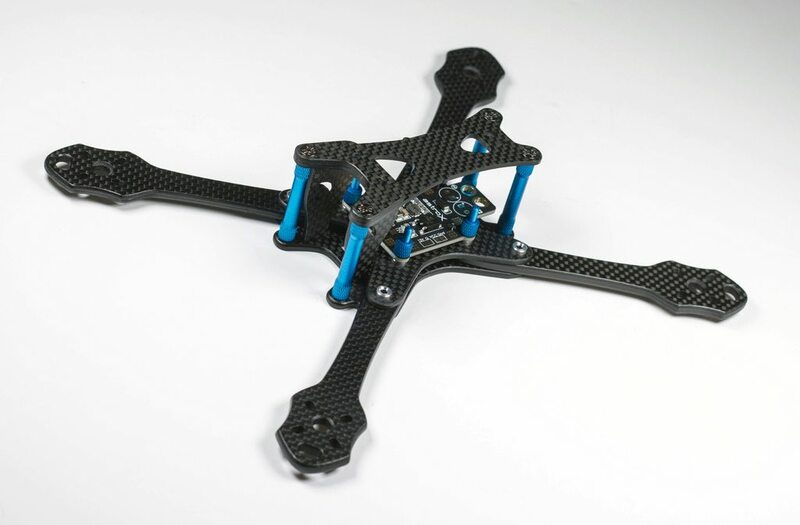 Here's a wide shot of the frame - it just looks so good with the matte carbon and blue colour scheme. 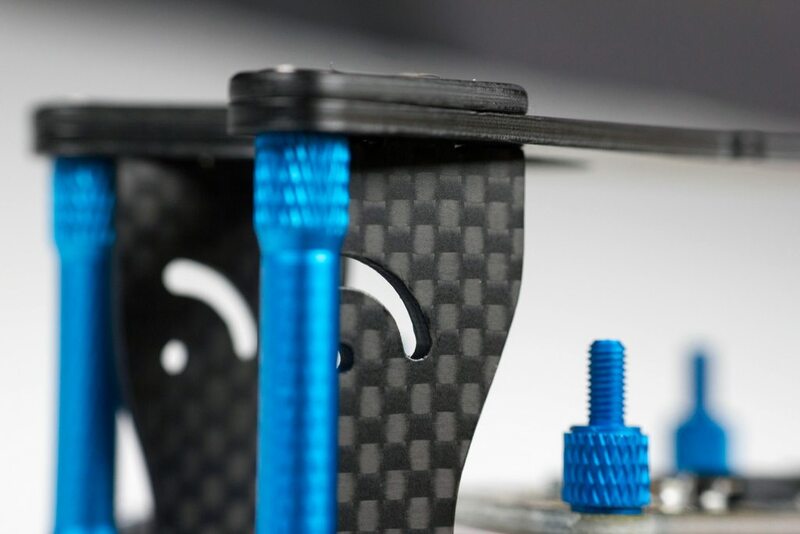 And finally the last bonus picture - we can see the extra carbon used to reinforce the front of the frame, with the blue highlights glowing out. 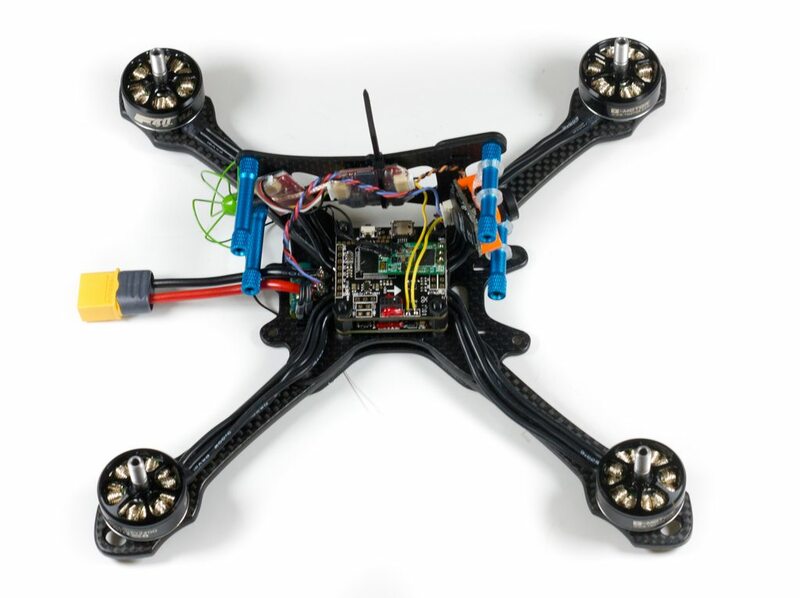 I was lucky enough to be part of the Beta testers of the new FrSky R-XSR that has just recently come out, so it felt fitting to put it into a rig that screams awesomeness! 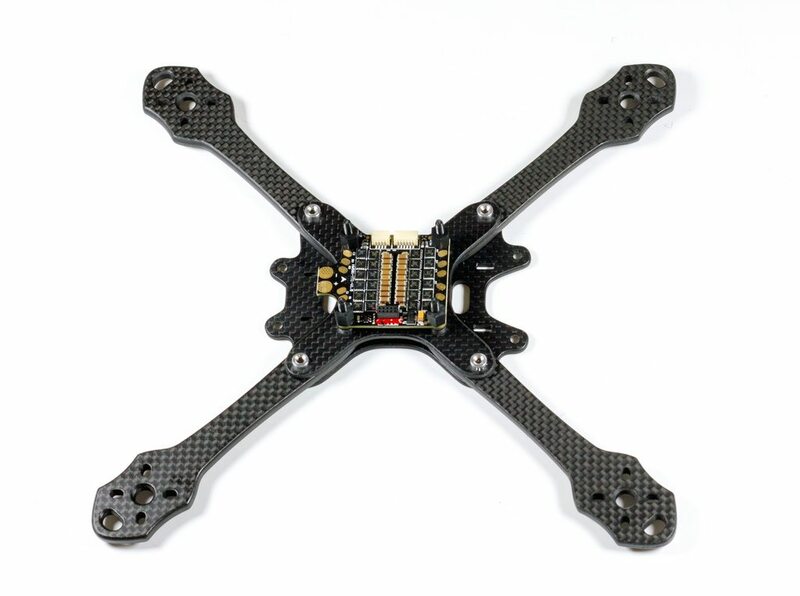 The top side view of the RX, you can see its rediculously small. It still has that connector people do not like from the XSR though. The bottom side is what makes it - no more soldering antennas, we have some IPEX connectors for quick antenna changes. Installation into the stack was quick and easy, a bit of double-sided tape to fit it onto the FC as we did with the previous RX. It's hard to gauge just how small this receiver is, so here's a wide shot with it on the flight controller so you can see. In the stack it looks nice and tidy! 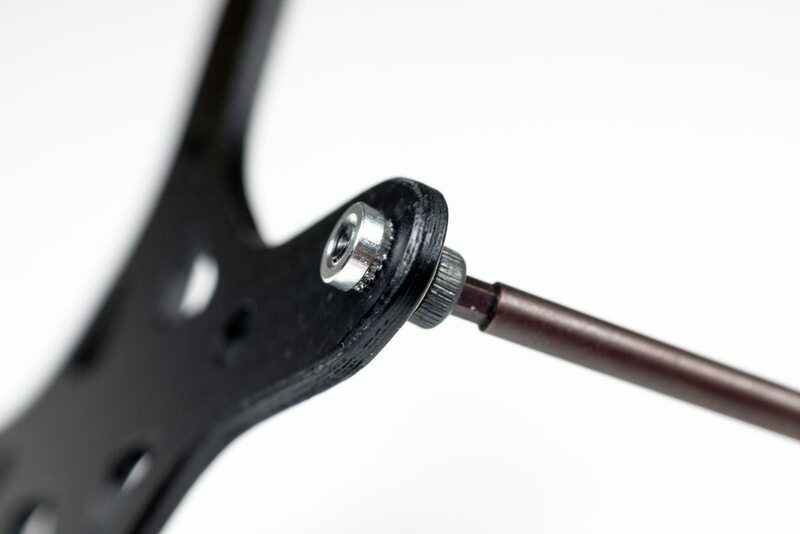 Easy to change arms with only a screwdriver required - no need to hold any nuts in place while you loosen a screw. 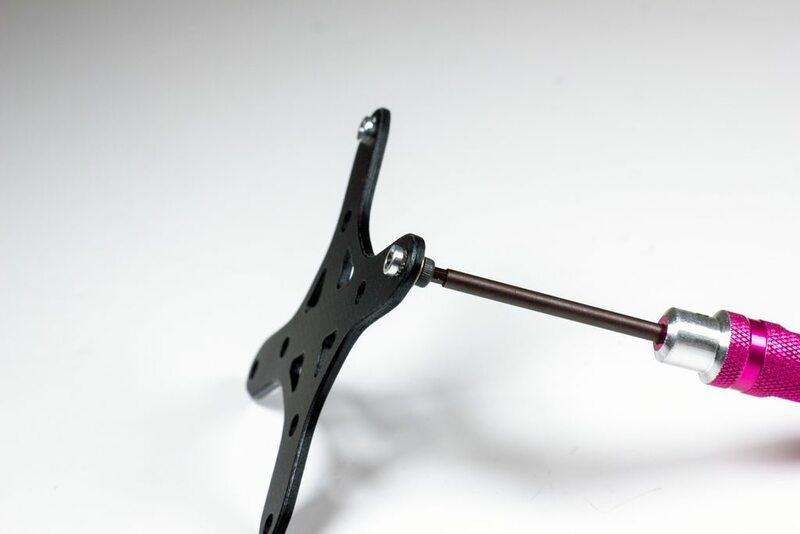 This is one of the best features out right now, and is key to any modern frame in my opinion when racing is concerned. This is where these press-fit nuts excel. You will want more - trust me. You'll buy a single frame, and then question why you only bought one. Before you know it, you'll have an entire AstroX fleet. Anyway, the whole build was super simple, the quality of the frame is absolutely second to none and seems to be remaining as the top manufacturer for quality of carbon for quite some time. I've supported and loved AstroX from when they first came about, and they've been innovating ever since. I think now we've seen a huge increase in popularity of AstroX as people are now aware of the brand and I'm super happy for Boohwan as he totally deserves it. As for the frame itself - it offers a great design and multiple configurations means regardless of what type of frame suits you, they have you covered. Even if you get bored or want to "Switch" down the line, the only items required are the bottom plates that will allow to you switch between the Freestyle, the StretchX and the ExactX. 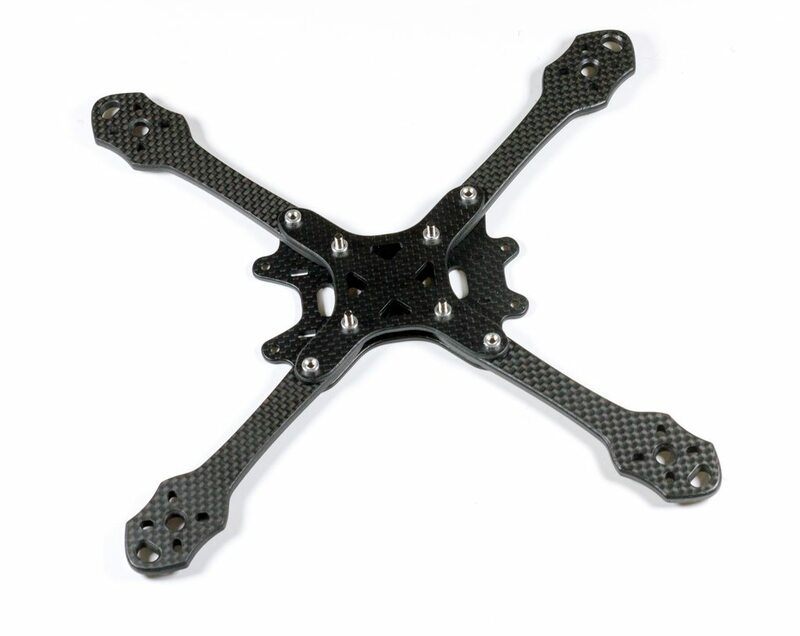 I think having this versatility in racing if you can handle the geometry changes makes for an excellent racing frame that will allow you to compete on any track - whether it's a longer and more open US track, or a tight and technical UK track there's modifications you can do without switching quads to keep that competitive edge above others.